Monday and Tuesday will be dry and warm across Colorado. The next storm is still on track to bring snow from Tuesday night through Thursday afternoon with 10+ inches possible in the northern mountains and the softest and deepest powder likely on Thursday morning. After that, our next chances for snow will be April 21-23 and again around or just after April 26. Countdown to 4/24: the best deals on the '19/20 Ikon Pass and a winter of adventure are happening now. Starting at $649 for adults, get more out of your pass with promos for kids and an easy-does-it payment plan. Lock in the adventure at 39 destinations and stomp this sale before prices go up on 4/24. Visit IkonPass.com to lock in your '19/20 pass today. Following Sunday afternoon's clouds and showers across the northern and central mountains, we should see drier and warmer days on Monday and Tuesday. Expect plenty of sunshine with high temperatures in the 40s on both Monday and Tuesday. My thinking for the storm from Tuesday night through Thursday afternoon hasn’t changed much. 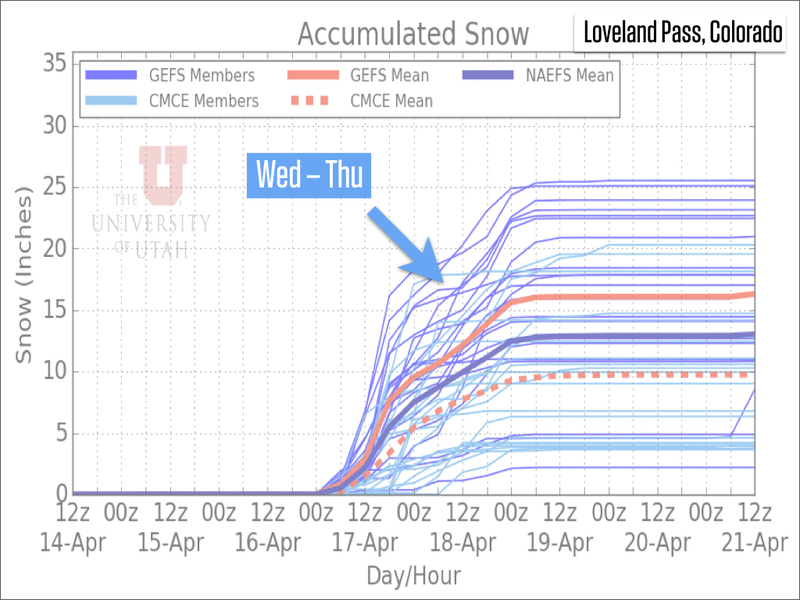 All mountains will see some snow, the northern mountains should get the most (10+ inches), and Thursday morning continues to look like the best time to find deeper powder. The snow on Wednesday could be underwhelming as this first part of the storm lacks organization. Maybe we’ll get lucky and a few stronger cells will drop a quick 3-6+ inches. Or maybe we won’t get lucky. The snow potential on Wednesday night into Thursday morning continues to make me excited for deeper snow in the northern mountains. This second wave of energy will bring colder temperatures, and we’ll be under a favorable part of the jet stream which should provide added lift and a good chance for stronger bands of snow. While Thursday morning could be quite fun, I want to be clear that this storm is weaker and warmer than the storm last Thursday (which produced a deep and fluffy powder day), so please don’t think that this week’s storm will be an exact copy of last week’s system. We'll need at least 10 inches to cover the hard base, so if we don't get that, the new snow could still be fun on some areas, but it could be "dust on crust" in other areas. Also, this week’s storm could clear out pretty quickly on Thursday afternoon, so it’s likely that the sun will have an effect on the snow (either on Thursday afternoon or Friday morning). Friday and Saturday (April 19-20) should be warm and dry. Then all models continue to show a chance for snow starting around Sunday, April 21 and continuing through about Tuesday, April 23. This storm could favor the northern and eastern mountains. After that, another system could arrive on or just after Friday, April 26. My next update will be on Tuesday morning (and I'll post daily through the end of April).